The title of this post has nothing to do with mothers! Mums as used in this sense means “yummy!” in Swedish – very apt here if you ask me. In need of a quick lunch, I had a wander over to our local Ica hypermarket, where I bought a bag of their 60 / 40 % raw cabbage and carrot salad mix, and a tin of mackerel in a Paleo friendly tomato sauce – i.e. just water, tomato purée, and a bit of salt. Back at home I simply chucked in about a third of a cucumber, sliced, and dumped in a good handful of hot chilli flakes I had loitering with intent in a cupboard. The fish was then flaked into the salad bowl, and everything was given a nice old mix. Pow! Ka-zaam! Take that, lunch-time hunger demon! 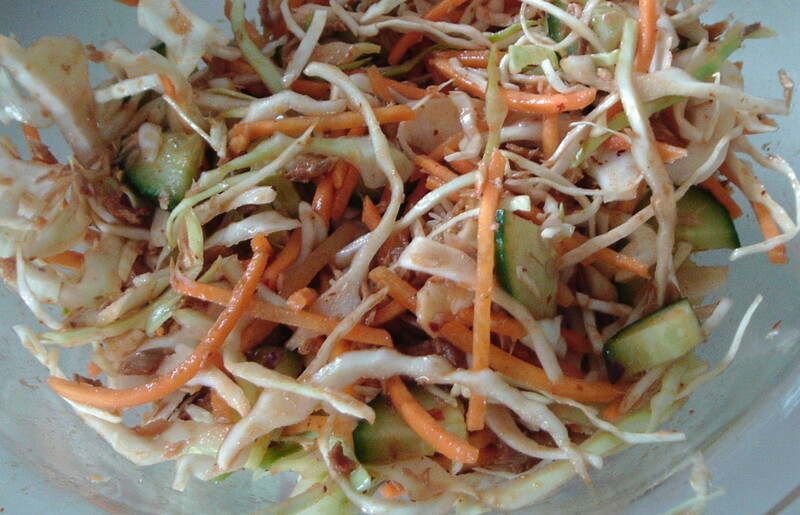 This entry was posted in Food Diary and tagged cabbage, carrot, lunch, mackerel, paleo, quick, salad, supermarket, tomato sauce on August 31, 2014 by paleovirtus. Swedish frozen yoghurt chain Yogiboost has been a favourite for some time now with Mrs. Paleovirtus and Paleovirtus Jr. The Paleovirtus clan was out on a shopping expedition yesterday, and my womenfolk felt the very real need for chilled dairy produce, and as we were in the proximity of one of Yogiboost’s boutiques, in we went. Initially I was prepared to sit there with one of their reputedly very nice eco-friendly coffees, but playing a hunch, we asked the staff working there if it was allowed to have a cupful of toppings, but no yoghurt. We were hoping they would say “Yes!”, working on the fact that the price of your cup is based on its weight, rather than its actual contents. “Yes indeed!” was the reply, and this made me rather glad, as the range of toppings available is extensive, more than 70 in fact according to the Yogiboost website, and includes all manner of Paleo friendly stuff. And so it came to pass that I loaded up my cup with grapes, kiwi, pomegranate seeds, blueberries, melon chunks, mango pieces, pineapple chunks, cashews, walnuts, and for that decadent finishing touch a good old dusting of dessicated coconut. There may even have been more fruit in there – I was like the proverbial kid in the chocolate factory, too excited and focused on filling the damn cup to take in-depth notes! All in all a very tasty, and more importantly Paleo friendly, pit-stop and re-fuelling session. 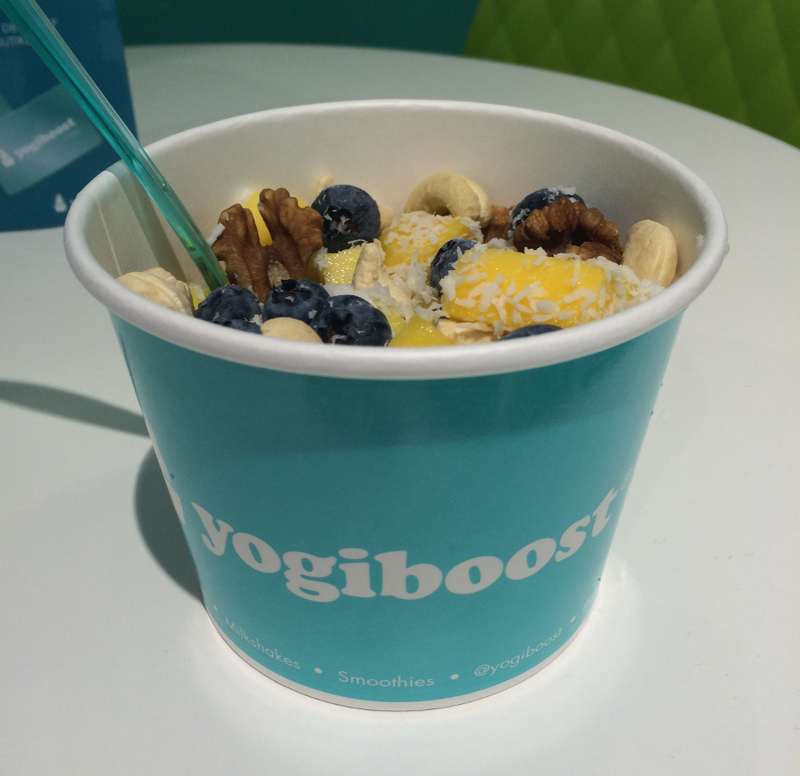 Thumbs up for Yogiboost! Oh, and the rumours were correct – the coffee really was excellent! 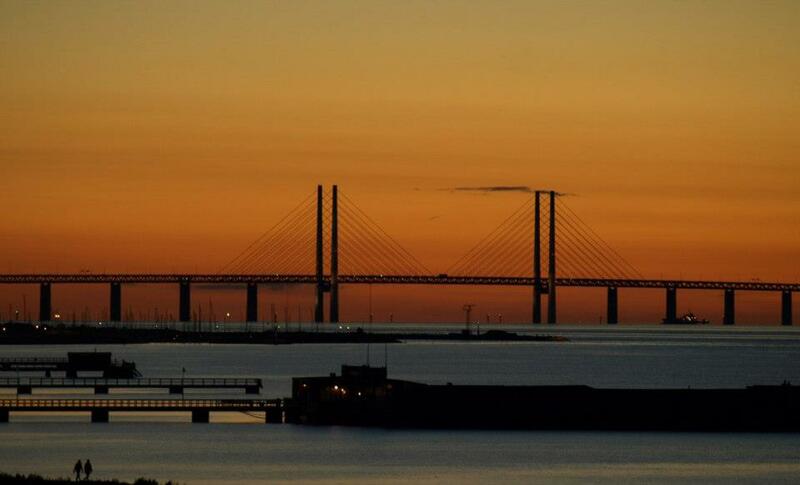 This entry was posted in Eating out, Food Diary and tagged paleo, Yogiboost on August 31, 2014 by paleovirtus. If there is 1 thing guaranteed to start a row in a roomful of cooks, it’s a “discussion” over what constitutes a “genuine” Bolognese sauce. Our family recipe does, it has to be said, stray somewhat from the path of righteousness – the paprika is bound to raise a few eyebrows – but we giveth not a fig, flying or otherwise. This recipe has evolved over many years to suit our own foibles and preferences, and this is its latest incarnation, Paleo style. This was achieved by the removal of 3 ingredients – white wine, cream, and stock cubes. Mrs. Paleovirtus and Paleovirtus Jr. opined later that this Paleo version was every bit as good as it ever was, if not even tastier, by virtue of it being “lighter”, less oily. On the dishing-up side, boiled glue was obviously out of the question, so we went with a zucchini / courgette tagliatelle. The Parmesan cheese normally dumped over the finished dish was substituted with ground almonds, which, again, worked a treat. Heat about 2 tbsp of olive oil over medium heat in a deep non-stick pan. Fry the bacon for about 5 minutes until starting to colour. Add the onions, carrots, and celery, and fry for about 10 minutes or so, until soft. Add the garlic, paprika, and thyme. Fry for a further 5 minutes. Add the pork and beef mince, giving it a good shot of black pepper. Mix well, and then stir fry, breaking up the mince and coating it with the spices and vegetables. Continue to stir-fry until the mince has lost its raw colour – about 10 minutes or so. Add enough water to give the mince a sauce to cook in. Stir in the tomato purée and add the bay leaves. Simmer on low heat for about an hour or so, keeping an eye on the consistency of the sauce, adding water if necessary. Our personal preference is for the final sauce to be quite thick, not runny in the slightest. Serve with zucchini / courgette tagliatelle, and ground almonds in place of the more usual Parmesan cheese. This entry was posted in Food Diary, Recipes and tagged Bolognese, courgette tagliatelle, paleo, recipe, zucchini tagliatelle on August 30, 2014 by paleovirtus. Another recipe that has been on the “Must Do” list ever since I bought chef Daniel Green’s excellent book “The Paleo Diet – Food Your Body Is Designed To Eat”. This is a ridiculously quick dessert to prepare. The only hard part is the waiting for it to chill sufficiently in the freezer. This entry was posted in Food Diary, Recipes and tagged almond, coconut milk, dessert, ice cream, paleo, recipe on August 29, 2014 by paleovirtus. This starter is based on a recipe in chef Daniel Green‘s excellent book “The Paleo Diet – Food Your Body Is Designed To Eat”. Once the eggs are prepared, which you can obviously do well in advance, the dish can be finished off and served in a matter of a few minutes, making it a near perfect starter. That and the fact that it is utterly delicious, of course. Start off by hard boiling your eggs – I boiled mine, which were medium sized, for 12 minutes. Allow to cool, the peel and chop. Set aside in a bowl in the fridge. Peel and chop the avocado. Add to the eggs. Add the dill, Dijon mustard, olive oil, and lemon juice. Mix well. Divide the smoked salmon between 3 plates. Spoon the egg and avocado mixture on top of the salmon. Garnish with a little extra dill, and lemon wedges. Serve and enjoy, taking a well earned breather before you’re back on your feet getting the main course ready. This entry was posted in Food Diary, Recipes and tagged avocado, egg, paleo, recipe, smoked salmon, starter on August 29, 2014 by paleovirtus. Due to various commitments, and those bothersome must-do post-move tasks, I’ve not really had a chance to do any real cooking since I made my happy, triumphant return to the Home Kitchen on Sunday last. Thankfully, today a window of opportunity opened, and I finally found myself with ample time available to plan, shop, and cook. I decided on a 3 course menu, 2 of which, the starter and the dessert, are ones I’ve been itching to try from chef Daniel Green’s book “The Paleo Diet – Food Your Body Is Designed For”. 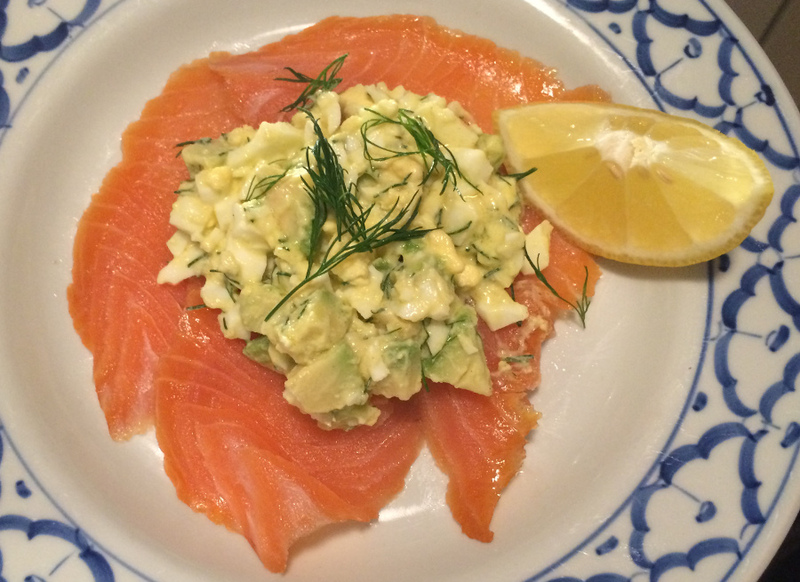 Cold-smoked salmon with egg and avocado, with a lemon juice, mustard and dill sauce. This entry was posted in Rants musings and gibberish and tagged Daniel Green, menu, paleo on August 28, 2014 by paleovirtus. Paleovirtus Jr. is in the process of moving over to a Paleo diet, and this was a sort of “proof of concept” exercise for her. She was, initially, quite sceptical that one of her favourite things, scrambled eggs, could be made by substituting almond milk for that white stuff squirted out of a cow. Quite cleverly, she wanted to make this, her Paleo version Mk I, with just eggs and almond milk, to judge the suitability of the 2 principle ingredients to each other. So, this batch was cooked in a non-stick pan in the usual way sans oil or any other fat, with 3 eggs and 3 tbsp of almond milk – no other seasonings or ingredients at all. Paleovirtus Jr. was mightily impressed – she was quite concerned that the almond milk would dominate or overpower the eggs, as she believes it does in other things, tea especially*. However, she pronounced this trial successful, and said that future versions would include a suitable fat to replace the butter she used to use in the non-Paleo version, as well as the return of the usual seasonings, and, gasp, perhaps even chives…. *Please note that this is not the official position of this blog – at all. I absolutely adore tea made with almond milk, and think Paleovirtus Jr. ever so slightly odd for thinking otherwise. 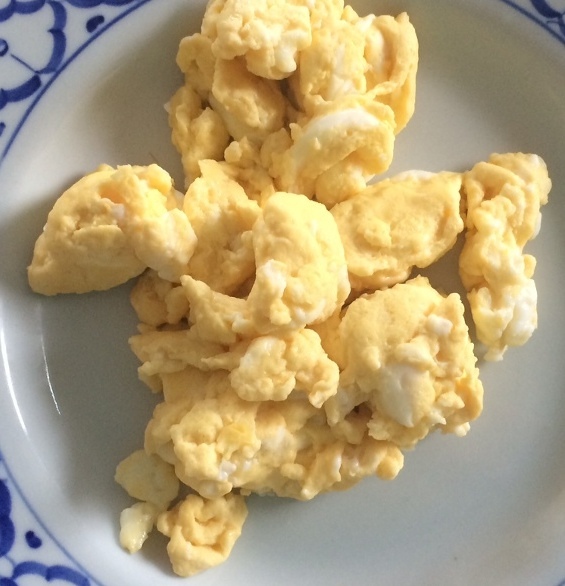 This entry was posted in Food Diary, Recipes and tagged paleo, recipe, scrambled eggs on August 27, 2014 by paleovirtus.